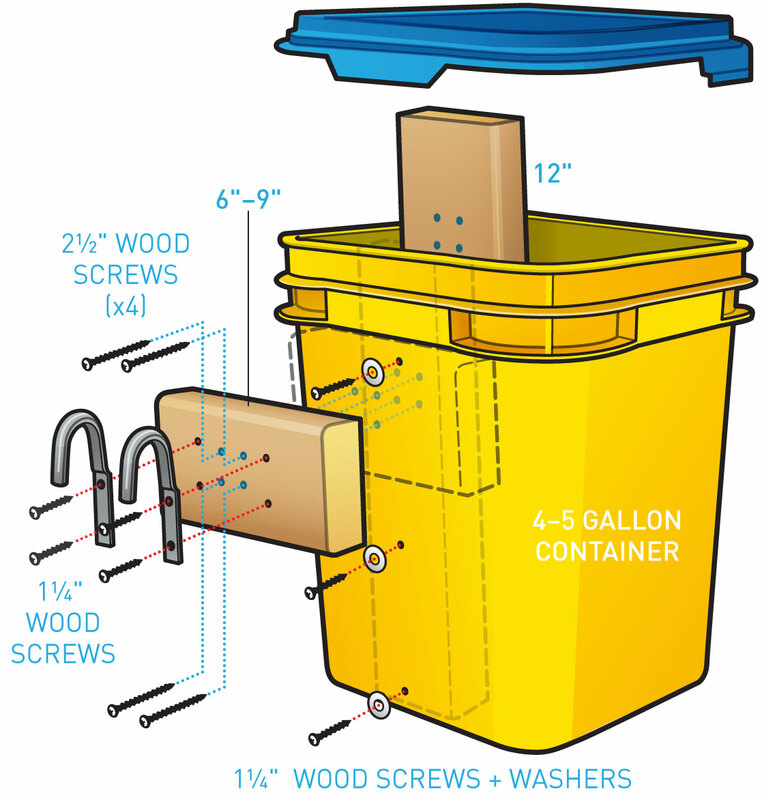 Build $10 panniers from 5-gallon buckets. With a couple hours and less than $10, you can build your own bike pannier out of a big plastic bucket. You’ll be hauling massive amounts of dumpster-dived organic vegetables before you know it! Of course, you’ll need a bike with a rack to mount these. If you don’t have a rack, they’re available at your local bike shop or community bike center. 1. Cut 2 small boards, one slightly shorter than the depth of your bucket, the other slightly longer than the area of your rack where you want to mount the bucket. I used a 13″ board inside the bucket and a 9″ board on the rack. 2. 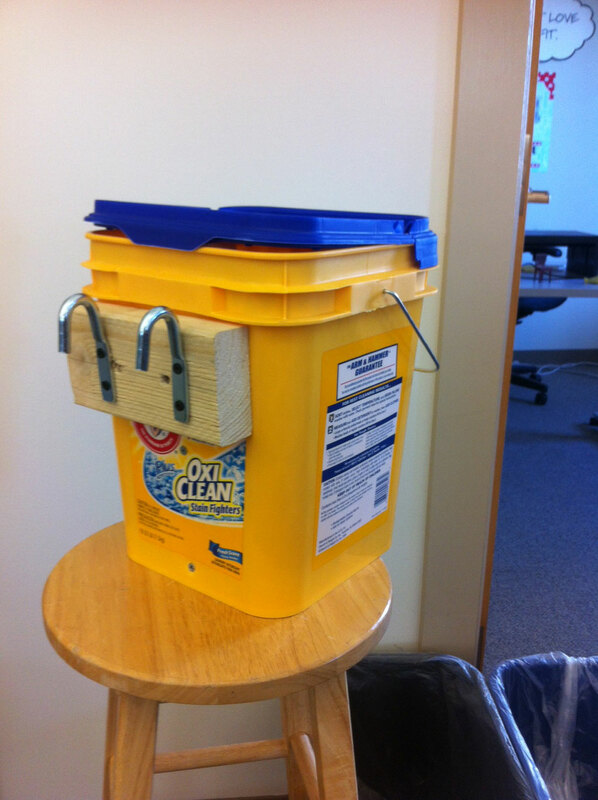 Attach the bucket to the inner board, using the shorter wood screws and washers on the outside of the bucket. Drill pilot holes first to prevent splitting. Stop tightening the screws when the bucket starts to deform: you don’t want them too tight, or you might crack the bucket. 3. Optionally, cut grooves in the outer board with a circular saw, to match the raised ridges on your bucket. This allows your bucket to ride a bit lower and closer to the bike. I made these at 1-1/8″ and 2 3/4″ from the top of my outer board. 4. Attach the inner and outer boards, through the bucket. Use the longer screws, drilling pilot holes first. 5. Mount the hooks upside down on the outer board, again with pilot holes, using the shorter wood screws. You want these to rest flush against the cross-braces on your rack, so your pannier won’t slide horizontally. Align the pannier carefully — too far forward and your feet will hit it as you pedal; too far backward and a bike at rest with full panniers will want to do a wheelie! 6. Optionally, paint your pannier in a shade that’s nice and visible for safety on the road! 7. Use the old bike tube to strap the pannier down and prevent it from bouncing off the rack. My rack had a perfect place to hook the valve stem, down near the rear axle; if yours doesn’t, you can attach it a different way, or just tie the tube tight around the bucket horizontally. 8. Enjoy your newfound cargo-hauling abilities! Add lights. The rear end of the outer board is a perfect place for a 2-watt flashing red LED! Increase security. Can you come up with an inexpensive way to make a locking pannier? Share it in the comments on the project page. Go bigger. What’s the biggest bag you can safely make and ride? Thanks to Brian Huntley and my friends at Bikes Across Borders for sharing their kitty litter panniers, and check out Star Simpson’s 5-Gallon Panniers for an even lower-cost take on bike bags. Happy riding, and heavy hauling! Bucket, plastic, 5gal or 4gal I like the square 4gal kitty litter buckets. Lumber, narrow, about 2' total length I used 2×4 softwood, but you could use 1×3 or even 1×2 hardwood. Tarp/rope hooks (2) a little bigger than your rack’s tubing, which is commonly 1/4"–3/8"
Wood screws, short (7–8) I used 1 1/4" screws. Wood screws, long (2–4) I used 2 1/2" deck screws.